The name, Shangri-La, is generally associated with the fictional Himalayan paradise referred to in James Hilton's 1933 novel Lost Horizon. But is also ubiquitous in popular culture as the name used for any concept relating to a hidden paradise or elusive ideal of perfect love, happiness, etc. Just east of Diamond Head on the Hawaiian island of Oahu you will find a Sangri La like no other. A paradise within a paradise, the Shangri La of the late Doris Duke (1912-1993) is a crossroads of cultures, celebrating breathtaking Islamic art and design in one of the most beautiful places on earth. After a lifetime of collecting and commissioning art and furnishings from Iran, Morocco, Turkey, Spain, Syria, Egypt, and India, Duke's collection includes over 3,000 objects. 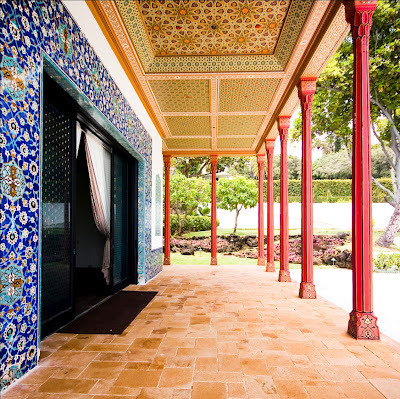 The estate was designed by Marion Sims Wyeth and includes the Playhouse, a scale version of the 17th century Chehel Setun in Esfahan, Iran. 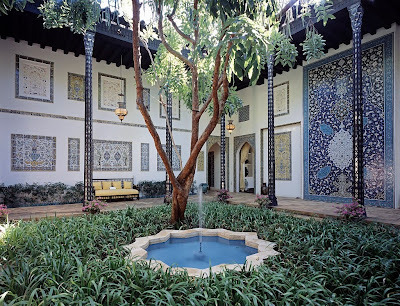 The grounds, inspired by Duke's love for the Shalimar Garden in Lahore, Pakistan, combine formal Mughal garden design with Hawaiian plants, landscaping, and fishponds.